I have an email account dedicated solely for my blog. Above is an accumulation of my UNREAD emails in about 2 days. So about 10am this morning I have approx 400 emails to sift through! This includes notifications, side bar comments, inquiries about various projects, giveaway collaborations, blog layout questions, personal advice, etc, etc. So “SORRY” if I’ve been slow getting back to you all!! I usually respond w/in a few days, so if you haven’t gotten a response in a week, please don’t hesitate to email me again! It might have been overlooked or got sent to my spam folder. Also, I receive a lot of emails regarding how long I’ve been blogging for. The truth is not too long. 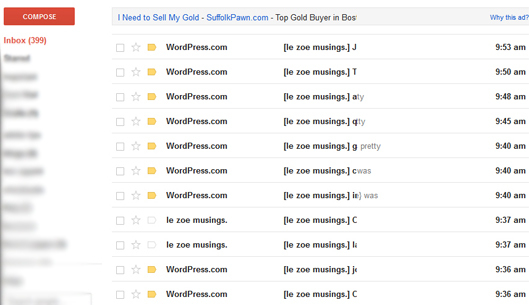 I started Le Zoe Musings in Feb of this yr and wrote my first post on Feb 7! (To read the FIRST post, click here.) So I guess that makes it a lil over 5 mths? And this is usually how it goes down! W/ Zoey on my lap as I am working. I know..pretty bad but she LOVES her mommy!! One last thing, we are heading out west to the LA/OC area this weekend for a short vacay. Any suggestions as to where to visit and dine? It has to be baby and mommy friendly. So clubbin’ and gettin’ down on da flo (ah- college days!!) at 2am won’t do! Thank you all for continuing to read Le Zoe Musings! I hope to continue creating content that will make your day a little more enjoyable and relaxing, if only for a few mins. Good look with the website and your daughter is too adorable! Bottega Louie is a beautiful restaurant for brunch, they have a bakery as well with some pretty treats. Definitely check out the beaches! Depending upon the weather, of course. You may want to bring a jacket as it can get chilly. Santa Monica is always fun. I’m, basically, just typing here so you open the email and go, “Well, that was a waste of time!”… which, oddly enough, is what most women say when they refer to me! Aw I wish I could still type with little one on my lap! He loves keys now. Oh my! I love the Orange County area. You have to visit Laguna Beach if you don’t visit any other beach in the area. Its amazing!! Also I liked shopping at Irvine Spectrum Center. If you want to do a day trip you guys can travel the Pacific Coast Hwy and head to San Diego to the San Diego Zoo. Its pretty awesome and I know the baby would enjoy seeing all the animals. We also enjoyed taking the boat over to Catalina Island for the day and seeing all of the beauty of nature over there. I saw some people taking their babies over when we went but I don’t know how practical it would be for you guys. Whatever you decide to do I am sure you will have fun!